American Bittern. Photo courtesy of Wikimedia Commons. The East River is NYC’s premier waterway and as founder of the LIC Community Boathouse and HarborLAB, I’ve made it my paddling home. At sunset, ferry boats filled with skyline gawkers will nearly flip to the west, and East River bridges set the scene for countless films. But for a kayaker, it’s the wilderness refuges of its islands and inlets that make this tidal strait endlessly fascinating. Returning to Randalls Island from Governors Island in the Sunday morning calm after City of Water Day, Caroline Walker and I paddled through the outskirts of Hell Gate toward Mill Rock. I was admiring Great Black-backed Gulls at rest and Double-crested Cormorants perched on the island’s rip rap skirt while drying their wings when I spied something a bit different — a bird with the shape of a heron but markings similar to an American Woodcock. Caroline described it as “brindled,” which is pretty apt. As we drifted past, a handful of cormorants and gulls took off while most ignored us. The misfit bird, however, walked quickly and deliberately into the brush that grew down from a turf mound to the rip rap line. It seemed to almost instantly disappear among the twigs and leaves. I didn’t have a camera. After some research yesterday, I realized how lucky Caroline and I were! We had spotted an American Bittern. This species has fantastic camouflage for its reedy habitat, and so is rarely seen. Sadly, its population is declining rapidly with diminishing wetlands (though I’m comforted that its conservation status remains “least concern“). Good places to seek them are Pelham Bay Park (join Wild Metro for a volunteer day) and Jamaica Bay Wildlife Refuge. But they can pop up well away from salty shores. Prospect Park Lake, in the heart of Brooklyn, may have drawn this other one. The American Bittern I observed was silent, so I have something to look (or rather, listen) forward to! Survivor. Photo by Barry Masterson of Kayak Staten Island. Sharp-eyed Nature Calendar reader Christopher Johnson spotted this seal casually sunning its shark bite wound on rocks near Swinburne Island, in a gallery published at SILive.com (Staten Island Advance, photo by Barry Masterson, co-founder of Kayak Staten Island). The question is whether this bite occurred in local waters or if the seal is healing up from an attack out east. Breathe a little easy, for now, says Paul Sieswerda, a shark expert and seal watching guide (and fellow Frisian). Paul has kindly written about sharks for Nature Calendar before, and was profiled in The New Yorker for his seal trips. I got to know him when I broke the story of seals returning to New York Harbor a decade earlier in the New York Times. That discovery was made by fellow kayakers (I joined for the confirming trip), who have now gotten familiar with porpoises. It seems inevitable that larger sharks will return to our waters as the estuary grows cleaner and more bountiful. Prospects for that are good, if unnerving, with the Wildlife Conservation Society’s New York Seascape Initiative fostering the process. Last summer a NYC beach was closed in the Rockaways after a thresher shark sighting, but sadly the specimen was found dead the next day. A series of attacks in New Jersey became the stuff of legend nearly a century ago. Several sources report large sharks being caught off of lower Manhattan before the 20th century, perhaps attracted by rotting meat scraps tossed into the Hudson River. It also seems the Narrows were then, as now, a hot spot for finding larger creatures. A fun exploration of this topic by Tom Vanderbilt was published in the New York Times a few years ago, bearing this gripping image from the New York Historical Society. Chaos in the Narrows (circa 1880). Collection of the New York Historical Society. If you see a shark, please report it to the Wildlife Conservation Society’s New York Seascape Initiative. If you see a marine mammal or turtle, even in good health, please report it to the Riverhead Foundation. If you have the urge to get out there among the big fish, please volunteer at a community boathouse on the NYC Water Trail. Tulip Trees, a-Flower and Afloat. Recently the Shinnecock Nation in eastern Long Island crafted tulip tree canoes to revive the tradition. Note the long, seamless canoes that our forbearers paddled on this estuary in the 1626 illustration (found by my co-authors of the East River book) below. Felling tulip trees in New York City isn’t welcomed today, but strolling among them certainly is! You’ll find them in Central Park, Prospect Park (an earlier entry showed a red-tailed hawk perched in a tulip tree in Prospect Park), and other large greens. Perhaps the best place to appreciate them is Tulip Tree Allee in the New York Botanical Garden. It’s wondrous to see such delicate flowers growing on such a giant — when hiking the Appalachian Trail you can see them reach 180′ tall. Within New York State, the greatest number are concentrated in the lower Hudson Valley and western Long Island. A great concentration can also translate to diverse coloration, as the species hybridizes easily. Though the cucumber-scented flowers resemble the tree’s European namesake, the species is actually a cousin of the magnolia. 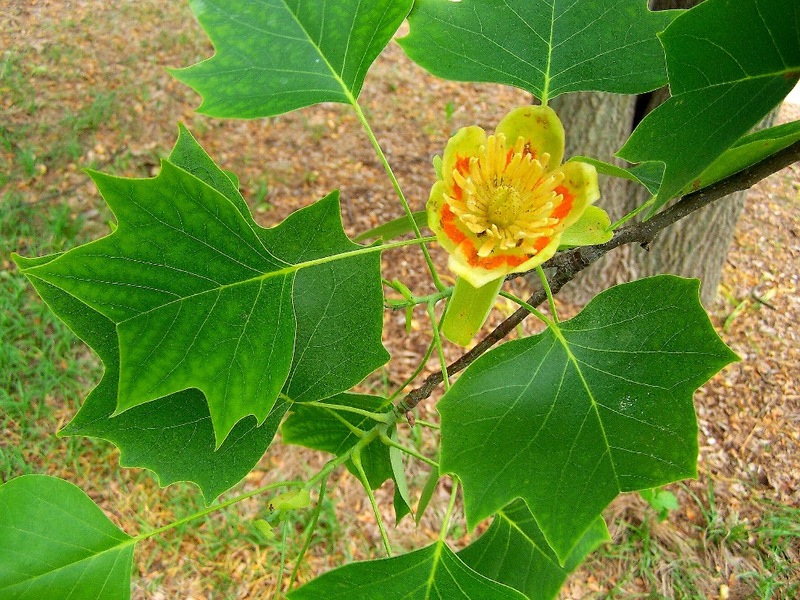 One beautiful coincidence is how a tulip tree’s life mirrors that of a human — it takes fifteen years to flower and can live 100 years. If you want to be part of this tree’s future, please consider joining the Eastern Native Tree Society or the Appalachian Trail Conservancy, or filling out this New York Botanical Garden volunteer application. Pete Seeger On Paddling the City. As we get ready for a new season of paddling on the harbor, I’m eternally grateful to Pete Seeger for making this video with Robert DiMaio’s Artist Archive project in support of the LIC Community Boathouse. I founded the LIC Community Boathouse to share my love of our waterways, and so that people inspired by their new love might nurture urban nature. We put thousands of people on the water each year for free, thanks to a great crew of volunteers and sponsors. As this blog demonstrates, you can enjoy eco-tourism in the company of wondrous plants and animals right here at home if you paddle, row, bike, hike, swim, or climb. You’ll be emotionally, spiritually, and physically healthier for it too! Then take that recreational access a step further with volunteerism and donations to stewardship groups. One great place to learn about, enjoy, and honor our region’s marine ecology is Pete Seeger’s own Clearwater Festival. Pete fell in love with the LIC Community Boathouse by seeing us in action at the Clearwater Festival. I enjoyed a wonderful walk with him across the grounds several years ago, introducing him to our work and goals. He was initially astonished. “I don’t call it the East River! I call it the East Express,” he joked, regarding how he had to relearn his Hudson sailing routines in triple time once on our waterway. But our safety success, generosity toward kids, and environmental work won him over. It’s a nearly inexpressible honor to have his blessing. I hope to see you at the Festival! Be sure to inquire about volunteering, donating, or exhibiting! Today we celebrate the 14-legged messenger of estuarine recovery, the gribble. 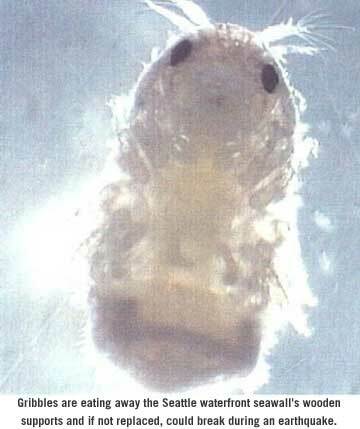 Gribbles might look like Pikachu (the preview box doesn’t work for this link, but clicking it will lead to an image) but countless of these speck-sized crustaceans (photo by Seattle Department of Transportation, click to enlarge)are devouring piers throughout New York Harbor, forcing reconstruction at a cost of millions upon millions of dollars. And in forgotten little historic corners of our once-working harbor, derelict barge-to-rail lifts, docks, and railroad ties disintegrate into their four-part maws. Gribbles (of which there are 56 species) and shipworms, another woodborer, were absent from large swaths of the harbor for generations because pollution levels were too high, and oxygen levels too low, for them to survive. Indeed, in a truly Orwellian twist of language, ours was known to sailors as a “clean harbor” because local waters were such a toxic broth that unwanted critters would die off of ships. Now we appreciate that the gribbles’ return heralds the ecological recovery of our vital waterways. For a long time the logic of the gribble diet was a mystery: gribbles lack the nitrogen-fixing bacteria in their bellies that symbiotically allow termites to survive on the carbon riches of wood. In short, they were endlessly gnawing through wood that provided little nutrition or energy to them. The secret, it turns out, is geometry. Old wood in seawater, like our harbor estuary, has a slimy surface. That, scientists have discovered, is the true diet of a gribble. And by tunneling through wood, and having succeeding generations of gribbles widen those tunnels, gribbles dramatically increase the surface area on which the nitrogen-rich microbial slimes can grow. A feast for generations of gribbles to come. What’s even weirder is that microbes cling to gribble’s excretory plates, called pleopods, to catch nitrogen bound in waste ammonium. It’s a partially self-perpetuating cycle. Humanity may have played an important role in transporting gribbles aboard wooden ships, but the species has been thriving long before the invention of the simple raft. In terms of ecological niche, the crustaceans take the place occupied by fungi on land, converting the tough material of dead wood into a mush that is a rich base for new growth. Over time, natural driftwood and unanchored seaweed (gribbles munch down the holdfasts that anchor seaweeds) can travel thousands of miles. One might argue that our acceleration of this process and the increase of volume but not diversity of wood (only a few types make useful keel lumber) might have reduced the biodiversity of gribbles. And our marine construction techniques might also be introducing an artificial selection: one species, L. tripunctata, can take down piers treated with the toxic wood preservative creosote (a carcinogen for humans) through a symbiotic partnership with bacteria that degrade the coal-derived chemical. One question I’d like to explore is whether gribbles limit the width of their tunnels, or at least entrances, to the diameter of their pleotelsons, a rear end plate that they can use as a defensive barrier. Or does their burrowing cause the home log to crumble before any particular tunnel is likely to reach such widths? Or has a communal effort to adjoin pleotelsons been observed?